We stepped off the metro into the scorching heat, unsure of where to go. We found ourselves in an unknown neighborhood in an unfamiliar part of town, spontaneously searching for the elusive festival of Madrid’s patron saint: San Isidro. There were crowds in every which direction. “Which way should we head?” Daniel and I asked each other. We followed the path with the heaviest traffic, apprehensive of our new surroundings. We turned down an unassuming street, lured by the thumping of music and flurry of balloon vendors being chased by exuberant children. We spotted the entrance to the park, Pradera de San Isidro, colorfully adorned with unlit twinkle light signs and bottlenecked crowds. Upon entering the park, we were immediately overcome with the intoxicating scents of grilled meat and cotton candy wafting through the air, along with the sweet smells of anis-flavored donuts called rosquillas. 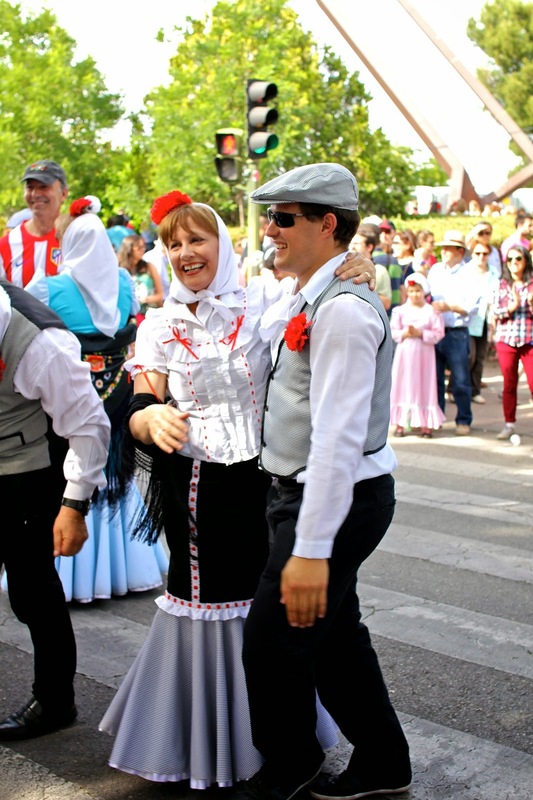 Amongst the throngs of festival-goers carrying enormous cups of tinto de verano were locals dressed in old-fashioned chulapos and chulapas, the traditional costumes of madrileños. 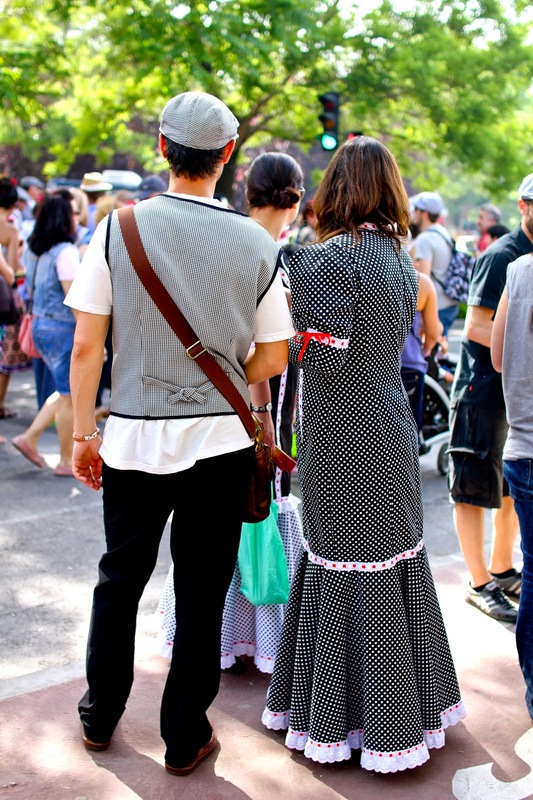 Like a less flamboyant flamenco dress, chulapas are typically paired with an embroidered shall and a white head scarf with bright red flowers on top, while the men’s dapper chulapos entail houndstooth flat caps, waistcoats and jackets with a red carnation in the lapel. The locals effortlessly donned their vintage attire as they wandered past the myriad of food stalls lining the bustling pathway, occasionally purchasing a steaming plate of paella, a rich assortment of meats or a greasy scoop of huevos rotos to soak up the massive portions of sangria and Mahou beer being served. Darling children dressed in picturesque chulapos stood entranced in front of the cotton candy machines, while boisterous vendors enticed us with chorizo, bocadillos and other beckoning treats. 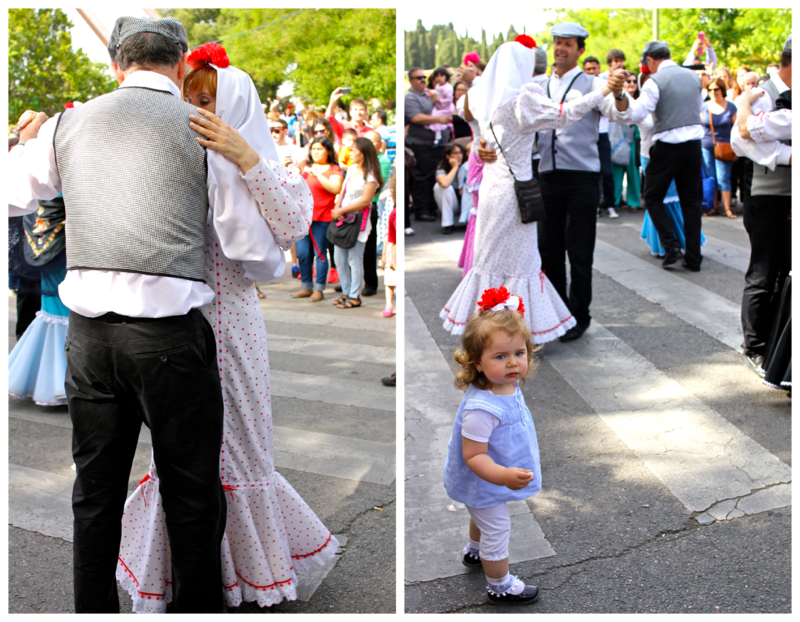 Although tempted by the mouthwatering Spanish versions of fair food, we continued strolling towards the church, where we happened upon a group of locals dancing the traditional chotis. In their customary dresses, the men and women glided across the pavement with grins on their faces. 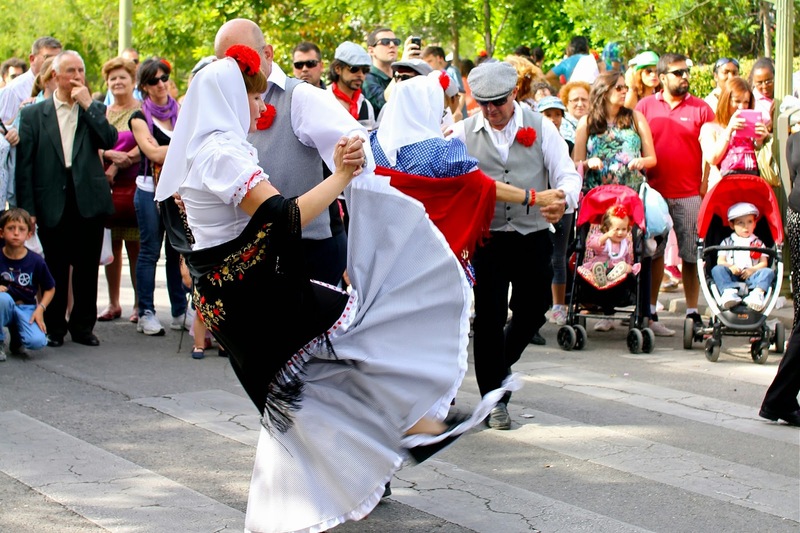 A few enthusiastic crowd members eventually made their way into the festivities, including a lively elderly woman who had probably drank one too many sangrias and was hell-bent on inching her way into the middle of the dance circle. Her husband chuckled along with us as she danced the chotis solo, unintentionally stealing the show from the dancers. At this point, I had difficulty comprehending just how sprawling this park was. The festivities were seemingly never-ending. We turned the corner to discover yet another long promenade alongside grassy knolls, besieged with food vendors and a large stage at the very end. My stomach was growling with hunger, but I couldn’t even begin to fathom the infinite number of options. Then just as fate would have it, Daniel and I passed a large pan of huevos rotos that we simply couldn’t resist. Although I typically can never resist huevos rotos – my all-time favorite Spanish dish comprised of fried eggs atop French fries and sprinkled with bits of jamón – this batch looked particularly enticing. We settled down with our drinks and began to feast upon what I now look back on as one of the most satisfying meals of my life. 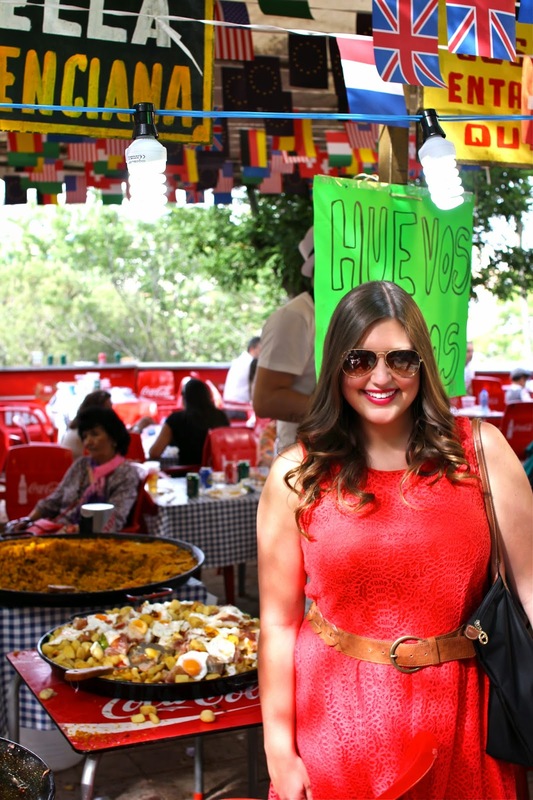 Fueled by a mix of fair food and tinto de verano, we made our way through the park and back to the metro station, where we ventured to La Latina for some more savory Spanish treats. I dragged us to Taberna El Buo, where we relished a tortilla española with caramelized onions and goat cheese. My heart was just as happy as my stomach, for our escapades were turning into the perfect day. Our goal was to head straight to Parque del Buen Retiro where the city was holding a fireworks show later that evening, but we got sidetracked by a concert in Plaza Mayor. As I swayed along to the music for a couple of songs, I couldn’t help but soak in my surroundings with awe and have a profound “Oh my God, I live in Spain” moment. The scenery was entirely magical. I could have stayed there for the rest of the evening, but we had a fireworks show to attend to that I simply refused to miss. We arrived to Retiro with only a few minutes to spare. A single shot rang out in the dark, and we raced to get a good spot in front of the glistening pond and regal Monument to Alfonso XII, whimsically lit up and changing colors. Soon the majestic explosions began, bursting with bright hues and synched to the soundtrack of a dramatic orchestra. I couldn’t help but grin up at the sky as if I were a child again. We dodged the crowds and began the long walk home, past the glowing Metropolis building and up Gran Vía. The city lights sparkled against the deep navy sky, while the warm breeze made me feel undeniably present and alive. I was buzzing with an electric happiness, immensely satisfied with our day’s many successes. It was the perfect day through and through, proving itself to be one of my favorite memories in Madrid thus far. Linking up today for Travel Tuesday! 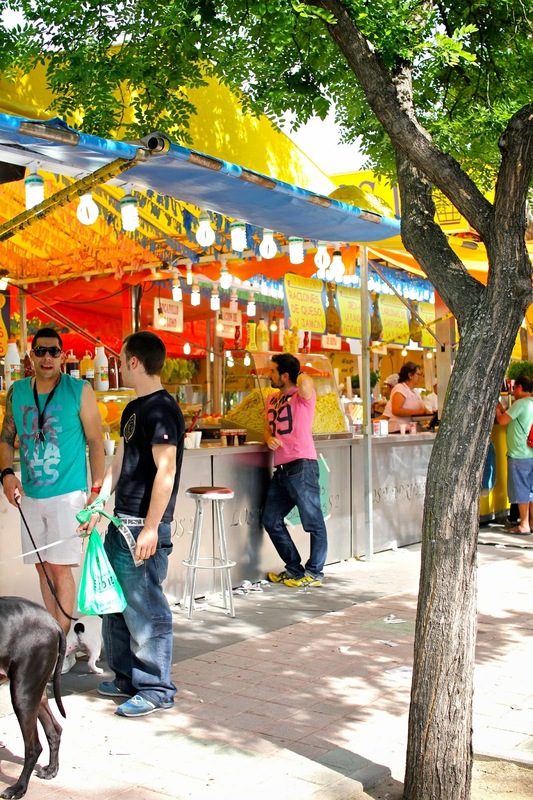 14 comments on "Celebrating Madrid's San Isidro Festival"
Loved this post. Was just in Madrid a few weeks ago and loved it! I'm so glad you loved it! It's such a magical city. Oh the paella looks delicious!! Makes me really hungry right now! Anyway I love those local festivals that truly represent the local culture instead of just being an attraction for tourists! This one looks like a lot of fun! Exactly, these kinds of festivals are a great way to get an insider's glimpse into a new culture! I almost felt Spanish for a day! Sounds like such a magical and very Madrileño day! Thanks for sharing! Thanks! It was actually hard to capture them because they were moving so fast. They made me wish I knew how to actually dance! What a fun festival! That food looks amazing. I would love to get to spend a day wandering around there eating the food and watching the dancers. Wandering around the celebrations truly made for the perfect day! This sounds like it was an amazing day. 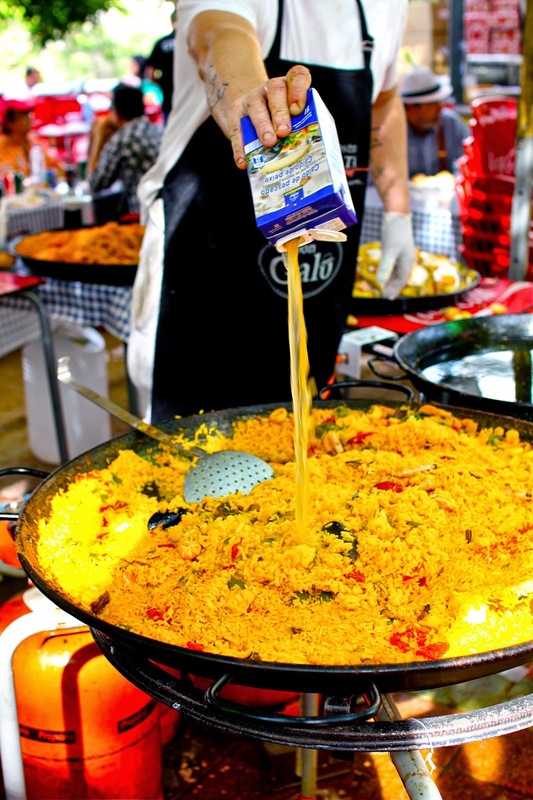 I love paella - there is a place in Borough Markets in London that make a great paella. I bet this one is even better! The food was honestly to die for. Spain sure knows how to celebrate the right way!